Michael Wasley said the dramatic win over fellow Gloucester potter Robert Milkins, which secured his place in the first round of the World Championship, was the "biggest of his career". Wasley, 24, smashed in a re-spotted black in a tense final-frame decider. The world number 75 sealed his debut at the Crucible with the last qualifying-round win at Sheffield's Ponds Forge. "I have known Rob for years and this was the biggest match of my career," said Wasley. "It couldn't have been any closer and I am just delighted to get through." Both players had chances to win the 19th and crucial frame. But it was Wasley, in his second season on the main tour, who potted a wonderful long-range black to secure victory. "I thought if I had any shot I will just go for it, I don't care," he said. "I will just hit it hard and if I miss, hope for a fluke. "I was a bit wobbly but managed to hold it together and am delighted to pot such a good black in the end. "It was really hard to play Rob, he is a great friend. It was a shame there had to be a loser." While Milkins heaped praised on Wasley for the win, he admitted the loss has made him rethink his game after early exits in the China Open, Welsh Open and German Masters following successive heavy losses to Ronnie O'Sullivan in December and January. "A really, really poor performance today, [it] really sums up my last six months on table! Time for some massive changes for new season," Wilkins tweeted. Wasley said he is not fussed who he faces when the first-round draw is made on Thursday. "An opponent is an opponent and I am out to win so I don't mind," Wasley said. "It's just special to be there as a Crucible debutant. "I went to watch many years ago. I saw Paul Hunter play and I saw my good friend Judd Trump in 2006. I am just so happy to be playing there now, as oppose to watching. 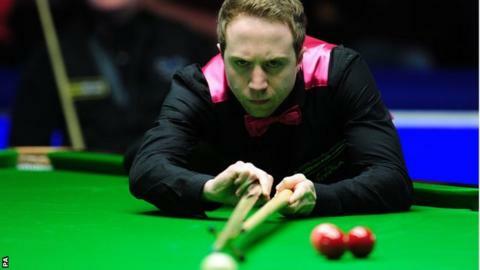 "I have played at a couple of venues but it will have nothing on the Crucible. I have a few days to think about it and will be as best prepared as I can be. "I feel my form has been pretty good. I have lost a lot of close matches but have been playing well. "I felt I was due a run and there is not a better way to end the season than to have a run in the World Championship."